I may be crazy but I’ve made a last-minute decision to join in with #the100dayproject that starts today! I’ve always been in awe of everyone that has done it in the past, and never imagined I could find an achievable theme that would keep me inspired for 100 days. But then I saw Victoria Johnson’s suggestion for birds, butterflies and blooms as a theme and all of a sudden I thought ‘Three of my favourite things to draw, I could do that’! There may be times when life gets in the way and days without a post, but I’m going to do my best to catch up on days that are less crazy. I’m also going to consciously fight my perfectionist tendencies and limit myself to a maximum of 30 minutes to work on each day’s motif. Hopefully I can experiment and use it as an opportunity to start my day creatively, or as a way to wind-down in the evening. I think the trick is to keep it fun! Here’s a sneak peek of my design for day 1, a zinnia. Maybe I should create a floral alphabet? I hope you’ll enjoy following along, and forgive me in advance for any days I miss or when I only have 5 minutes to do a quick sketch. I’m hoping the motifs will inspire some new pattern collections and illustrations. 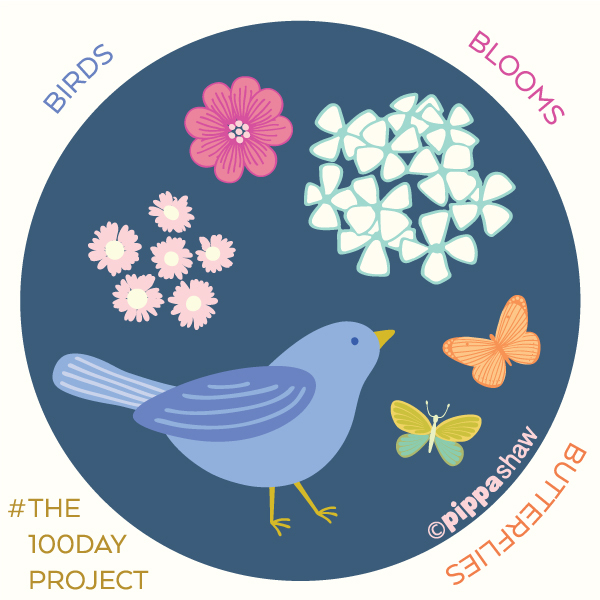 Are you joining in with The 100 Day Project this year? I’m looking forward to seeing all the creativity in my feed!